Get a clear idea on the kind of care that air ducts require in order to work properly by reading the tips below. 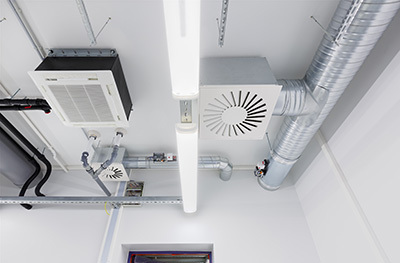 Maintenance is crucial clean, efficient and reliable air ducts. Read the tips proper cleaning and upkeep shared here and apply them to enjoy a variety of great benefits from fresher air to higher energy efficiency. They are highly useful for ductwork of all types, sizes and makes. It is a mistake to use any metal tool for probing the walls of the air ducts or a household brush to clean the area around the opening. Our technicians explain that tools which are not designed especially for the job can easily cause serious damage to the surfaces. One of the benefits of air duct cleaning is that apart from debris and dust, mildew is removed, too. As our cleaners say this is of the highest importance for avoidance of allergies and indoor air contamination. Though, mold must be perfectly clean and there must be no signs of moisture inside the ducts or mildew will soon grow again. Moldy air duct insulation requires replacement. While the HVAC ducts are made from rigid material, usually metal, the insulating material is porous. This means that the mold actually gets inside and damages it from within. Cleaning is not possible in this case so replacing the insulation is the only solution. Ideally, the insulating material should not retain water. If it is quick to dry, the risk of mold will be much lower. Unscrew the bolts, remove any debris and wipe the cover clean with damp cloth. If there is sticky dirt, wash and then dry the cover. When you have a good ventilation system throughout your home, especially in the bedrooms and bathrooms, you'll help to cut down on mold and mildew and actually help your body function better. A thorough cleaning of your air ducts, registers, grills and diffusers will keep the air in your home free of mold and mildew that can seriously affect your health.